Donesha Jackson, a junior at Bradley Tech High School, asked me this yesterday as we stood on the school&rsquo;s west lawn. I couldn&rsquo;t even begin to answer her. But this is the question that she and 34 other students from Bradley Tech and Bay View high schools have been grappling with for several months. The answer? The Milwaukee Observatory, an impressive, exhaustively-researched public art installation and urban archeology exhibit on the high school grounds (there is another location at the Bay View Historical Society). 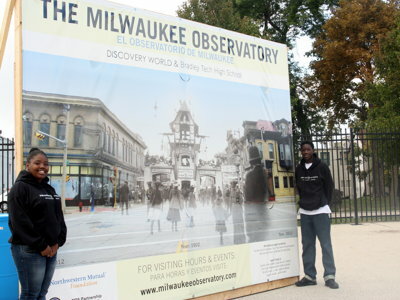 The culmination of Discovery World&rsquo;s 15-week Milwaukee Observatory program, the site contains 16-foot “personal archeology banners” depicting students&rsquo; individual history and genealogy, “Faces of the Future” boards with photographs of students holding historical objects and a Cultural Memory House inspired by the 1840 home of neighborhood pioneer George Walker. “It&rsquo;s a deep-dive immersive program,” she said. 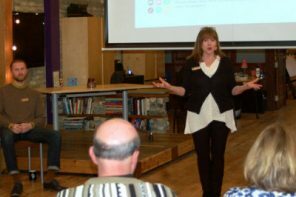 “The kids get the skill sets to be public educators. 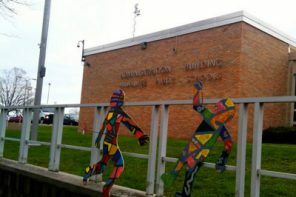 They get experience with visual arts and digital media; they give tours to the public. At the end there&rsquo;s an opportunity for nine students to have an internship with Discovery World. Jackson and fellow junior James Jones gave me a tour of the Milwaukee Observatory yesterday afternoon. Their knowledge of Walker&rsquo;s Point history &ndash; and Milwaukee history as a whole &ndash; was impressive. They spoke at length about the impact Latino immigrants have had on their community, about their experiences excavating the site of the former Florence Hotel and even gave me a personal history of the third-generation local plaster artists at Orlandini Studios. Bottom line: these kids know their stuff. Jones gave me a tour of the Historic Markers which are arranged in a circle around the Cultural Memory house. Each marker represents a historical figure who contributed to the development of Walker&rsquo;s Point. He showed me his favorite Historic Marker: Lucian Palmer, the first African-American to be elected to the Wisconsin Assembly. “I hadn&rsquo;t heard about him before this,” he said. Now this 17-year-old high school student has found a hero in civic leader from a century ago, and even wrote an essay about him for a class in school. I had great fun humiliating myself playing the Then & Now game, a challenge created by the students where the object is to match photographs of historic buildings with photos of how they appear today. Jones gallantly offered me hints, but I was only able to successfully match the Boerner Botanical Gardens to its historical counterpart. To that end, during the program the students excavated the site of the Florence Hotel, where immigrants would often stay for a short period after arriving in the city. They developed a site grid, performed shovel tests and had the opportunity to use high-tech excavation tools including ground-penetrating radar. They uncovered artifacts like glass pieces, screws and animal bones. “Who would have ever known that was there?” Jones said. The Milwaukee Observatory has not only connected students like Jackson and Jones to the past, but it has also illuminated their future. Jackson got her first paying job is at Discovery World, and Jones hopes to study engineering in college. “I actually want to get somewhere and I looked at this (program) as helping me do that. 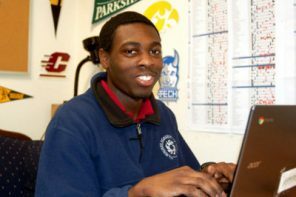 Now I&rsquo;m being offered scholarships and different positions that I never would have (had access to),” he said. Residents of Walker&rsquo;s Point are invited to visit the Milwaukee Observatory on the lawn of Bradley Tech High School this weekend from 10 a.m. to 5 p.m. on Saturday and Sunday. The students are anxious to share their project with the community and also to have the community reciprocate &ndash; they&rsquo;ve set up an interview table where they can record residents&rsquo; personal stories to contribute to their historical understanding of Walker&rsquo;s Point. But be warned: Jones will beat you at the Then & Now photo game.